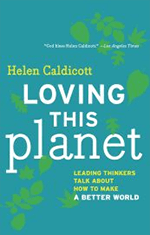 Loving This Planet - Helen Caldicott, M.D. More than two dozen internationally recognized advocates discuss the state of the planet in candid conversations with leading antinuclear activist Dr. Helen Caldicott. Ever since quitting her job as a pediatrician at Harvard Medical School in 1980, Helen Caldicott has worked tirelessly for a safe, sustainable, nuclear-free planet, most recently by hosting a weekly radio show featuring environmentalists and leading activists from around the globe. Together with some of the most brilliant thinkers and inspiring advocates of our time, including Maude Barlow, Bill McKibben, and many others, Caldicott—whom Meryl Streep has called “my inspiration to speak out”—scrutinizes our unsustainable dependence on nuclear energy and the absurdity of nuclear arms and seeks to raise awareness about other planetary issues, including deforestation, sea-level rise, and privatization of water reserves. In these stirring conversations, we hear from Martin Sheen on the power of grassroots movements and the ability of unionized labor to influence politicians; Jonathan Schell, bestselling author and contributing editor to The Nation and Harper’s Magazine, on key environmental and economic fallacies; and award-winning nuclear engineer Arjun Makhijani on transitioning to a society based completely on renewable energy, omitting the need for fossil fuels or nuclear power. Loving This Planet offers an informative and accessible overview of the chief environmental and social issues of our time.